This guest post was written by Alex Ahlund, the former CEO of AppVee and AndroidApps, which was recently acquired by mobile app directory Appolicious. He is currently an advisor to Appolicious . One of the most commonly asked questions we get from both developers and industry outsiders is: how much money can I make developing apps? It’s a hard question to answer. So we decided to conduct a survey. We asked for sale sdata from 124 developers that market applications ranging in price from 99 cents to $79.99. This survey was conducted on apps that ran the gamut of popularity, from wildly successful to barely breaking three figures. Developers were anywhere from funded companies with multiple titles under their belt, to first time, single-person authors. 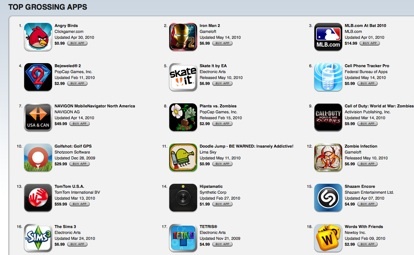 Both regular app developers, as well as game developers were included. This mining of data was intended to cover the entire iPhone app industry as a whole, without allowing outliers to skew the data too much in one direction. There are many different metrics that must be taken into account – just because product X sold well does not mean product Y will. As a longtime publisher of app reviews, I’ve always been a bit apprehensive about sharing cold, hard statistics because of this issue. Taken as a precise gauge for future iPhone apps, statistics can be completely misleading. Therefore, I strongly encourage you to interpret this information only as an overview of the industry, which, like any others, has its blockbusters, stragglers and everything in between. The following financial information is pulled from 96 developers who provided in-depth sales data and pricing metrics. The average total number of units sold was 101,024 copies within an average period of 261 days. The average number of units sold per day was 387. The average price was $5.49, although the data skews due to the $49.99 outlier. In most cases, the price point was $0.99. The average number of updates released was 3.89, with the average total development cost amounting to $6,453. Several developers omitted development costs and most did not include their personal time in these figures. It is safe to assume the cost would be at least five or ten times more when using a contracted team. But on average here, iPhone developers are seeing a return of more than 15 times their initial, albeit small, development costs. However, when the top 10% of the most successful apps are removed from the data set, the numbers skew much lower, giving a far better impression of what the iPhone industry looks like for most developers. In this scenario, the average sales were 11,625 total units, averaging 44 copies/day. Approximately 23% of apps sold less than 1000 units from launch (ranging from 12 to 370 days in the App Store). Further, 56% of apps sold less than or equal to 10,000 units, while 90% sold less than 100,000 units, with the remaining 10% achieving sales of 127,000 – 3,000,000 units. While industry wisdom states that application updates always boost downloads and sales, Apple has changed how updated apps are given exposure and this now doesn’t quite hold true. Some developers reported that updating the app gave only a small—and brief—spike in downloads. What did seem to have a larger impact on sales was a drop in price, although this also tended to taper off quickly. promotion, as expected, reflected what sort of increase the developer would see. Areas such as “New and Noteworthy” produced slightly less gains than “Staff Favorites” or “What’s Hot.” Generally speaking, it is safe to assume a 2-20X sales spike following being featured, with the effect lasting roughly a week or so before returning to average numbers. The key here is to use this dramatic spike to propel the app onto a top list—be it the universal top 100 or in a top list for a specific section or country. Once there, the app has a much better chance of moving up and reaching a higher plateau of sales. From a marketing perspective, the same tactic could be applied. While not all apps have the likelihood of being featured, focusing promotional efforts within a tight timeframe can be the key. Instead of spreading out marketing and advertising over the life of a product, focusing efforts into a narrow window (preferably, in terms of days) can be much more effective in getting the app onto a top list. Common marketing techniques include Facebook, forum posts, Twitter, own website, press releases, LinkedIn, app Review sites, blogs, friends, contests, YouTube, advertising (Print, PPC, and banners), flyers, newsletters, Flash Demos, physical networking and podcasts. While each of these methods helped developers in some ways, the real marketing power to make or break an app product rested in the hands of Apple and their selection choices. Apps with successful products in other industries (tie-ins) gained a significant boost from that relationship. The same held true for developers with a known presence already on the web.